A nurse, who spoke to the Nation in confidence for fear of being victimised, said: "They tell me to my face that they want to sleep with me." Another said: "Last year, someone described the colour of the undergarment I was wearing because as I attended to others, he looked under my dress." Another described the ward as "abnormal" and "where unusual things happen". A spot check by the Nation yesterday found a male patient in a robe marked 'Newborn Unit'. He was smoking at the entrance to the ward. 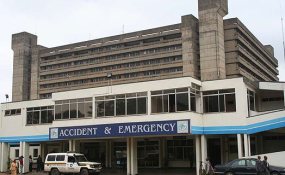 On Saturday, nurse Mildred Akinyi was assaulted by the father of a patient who died from leukaemia. Via Twitter, Nursing Council of Kenya chief executive Edna Tallam said: "Our health professionals give their best and they must be respected and protected."